And we have bad news just before we take off for Las Vegas. According to new Verizon training slides, the 1-year upgrade option that many of us have enjoyed for years is going away starting January 16th. 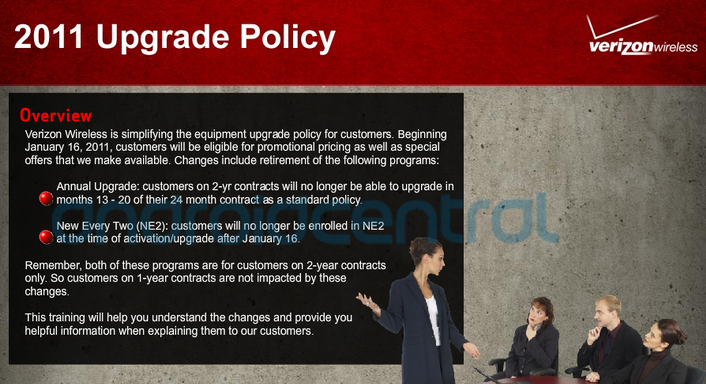 Customers on 2-year contracts will now have to wait until the 20th month of their deal to even begin to think about upgrading. Talk about depressing. We live in a time when phones become almost obsolete just months after they are released and having to wait at least 20 months for the option to upgrade is a giant step in the wrong direction. The good news is, we’ll be at CES all week and will have plenty of opportunities to drill VZW reps on this subject.